Let me start off by saying have you ever seen anything cuter? And for once, Loyals, I am not talking about the child. 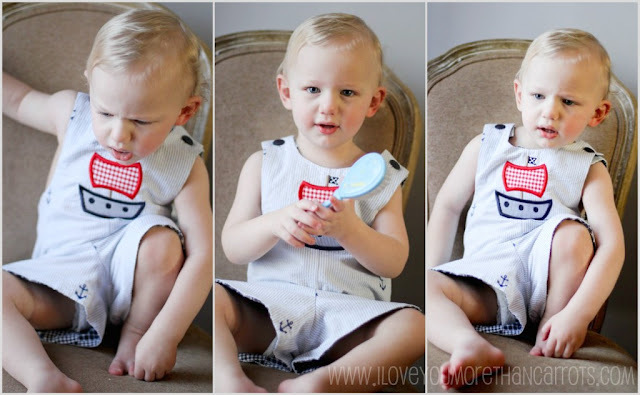 I am talking about the Just Ducky Originals Reversible Shortall he's sporting. I am so in love with Carter's new shortall that I could go on and on and on about just how much I love and adore it. And that's exactly what I'm about to do. Mostly because it's only fair that I share with you the amazing company that's responsible for the cuteness. When Just Ducky Originals reached out to me inquiring as to whether or not I would be interested in reviewing a piece of their incredible children's clothing, I pretty much had to stifle my excitement with every fiber of my being as I immediately responded to the Asheville, North Carolina email. With just a quick glance through their Spring '12 preview I was smitten. The pages of their Spring catalog are chock full of classic children's clothing, preppy fabrics, coastal colors, adorable kid prints and most importantly? Quality product. It is evident that Just Ducky Originals is all about timeless, quality, classic and custom children's clothing. Exactly what I look for when dressing my handsome little toddler boy. I had the pleasure of working with a few members of their incredible customer service team and I have to admit that once I finally decided upon an item, a custom item at that, (believe me, there are way too many cute things to choose from), everyone was so easy to work with. Patient, friendly and always willing to go out of their way to make sure both Carter and I were satisfied with the result of our order! One of the great things that I immediately loved about Just Ducky Originals is the ability to create a one-of-a-kind custom piece of clothing. This means that not only do you get to pick the style of the item, but also the fabric, the colors, the patterns and any specific applique or personalization that may tickle your fancy. 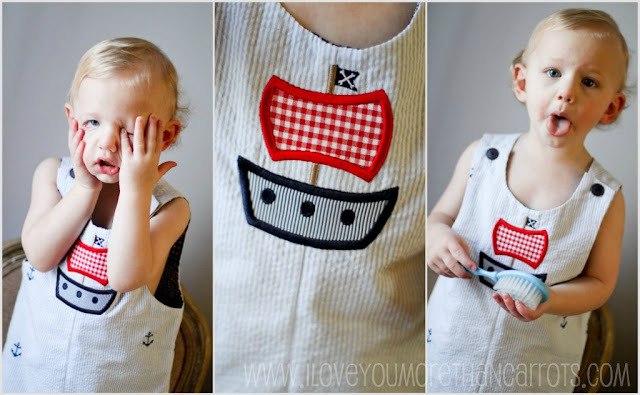 You literally get to design your child's clothing down to every last little detail. We're talking right down to even the ricrac and buttons! It's almost as if you're working with your extremely talented Granny who's making each of your child's custom clothing pieces with the utmost love and care. And let's not even talk about how ridiculously cute and amazing their Just Ducky Originals designs are! I could be here all day. I cannot encourage you enough to visit their website and check out their catalog. With so many styles to choose from, I can guarantee you'll want one of everything! From Capris, Dresses, Bubbles, Bloomers, Overall to Swimsuits, and more! I was dying to show you a picture of the reversible side of Carter's shortall, but when I politely asked him if I could turn his shortall inside out, this was the face I was met with. You'll have to believe me when I tell you that the inner navy madras fabric is just as cute as the outer seersucker! Two outfits for the price of one. You just can't beat that, Loyals! 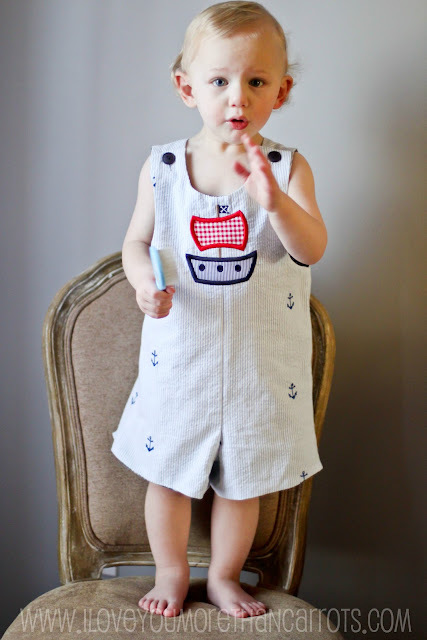 Before I share even more adorable pictures of Carter in his new shortall, I also need to tell you about an incredible opportunity with Just Ducky Originals, one that I am eager to get involved with. Just Ducky Originals offers us Moms an incredible opportunity to get involved with the selling of Just Ducky Originals products in the form of their Home Shows Program. Moms are offered the chance to hold trunk shows comfortably in their homes and receive discounts and rewards to use towards their very own sweet Just Ducky Original purchases. Earn cash commission and a 40% discount on your clothing purchase. Just Ducky Collections include affordable cotton knit Essentials lines from sizes 6 months to 7/8 so every child in your house and their friends can look just as adorable! Easy-to-use training materials will help you make your Just Ducky Home Shows successful as ever! Consultants have access to an online design page where you can show your customers what specific garments will look like in different fabrics. Last but not least, if you become an Area Consultant and manage other consultants you can earn both cash commission on all parties and a 40% discount on your clothing purchase. Too busy to be a consultant but want a little “bonus?” You can simply host a home show and earn 10% clothing credit based on your sales! Interested? Click here to check out their Home Shows Program information page and read information on how to become a Consultant, Area Consultant and even find local shows in your area! Be sure to like Just Ducky Originals on Facebook and stay up to date with their latest and greatest children's wear! Not to mention if you're extra lucky, you may even catch a fantastic flash sale or two! 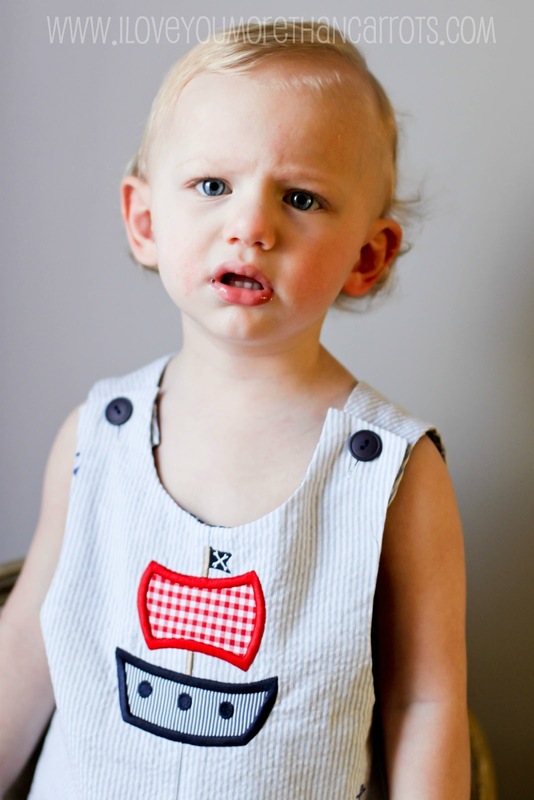 Thank you so much for your adorable, incredible, affordable and classic children's clothes, Just Ducky Originals! We cannot wait to add to our collection! The clothes and the kid are both adorable :) such a cutie! adorable clothes, adorable face, all around ADORABLE going on here! So cute...love his hands in face poc...too funny!! How precious! I'll definitely go have to take a look at their baby girl items!!!! I love it! It's Time For Sass and Open Letters. So, What's Carter Thinking? Caption Contest. Bumpdate :: 17 Weeks and Growing! Cravings, Curlers and Beautiful January Weekends. 5 Rules To A Successful Blog Post.... C Style.